ChefVille Guide: Win 3 Free Spices! 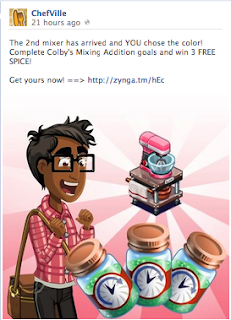 If you haven't completed Colby's Mixing Addition goals yet, be sure to click the Link below to do so. You will will receive 3x Free Spices. Once you complete these three goals you will receive 3x One-Hour Thymes. Apparently ChefVille players are having trouble getting the second pink mixer after completing these Colby's Mixing Addition goals.